MILFORD -- When Ken Waeber fell in love with a Queen Anne Victorian in Milford, he didn't know how many big projects lay ahead. Or that it would lead him to a new hobby -- reading books about both home renovation and Victorian society. What he did know was that the house was something special. "The house is amazing," he said. "Everything is what it was in 1878. It's the only house that I have been in that's like this." 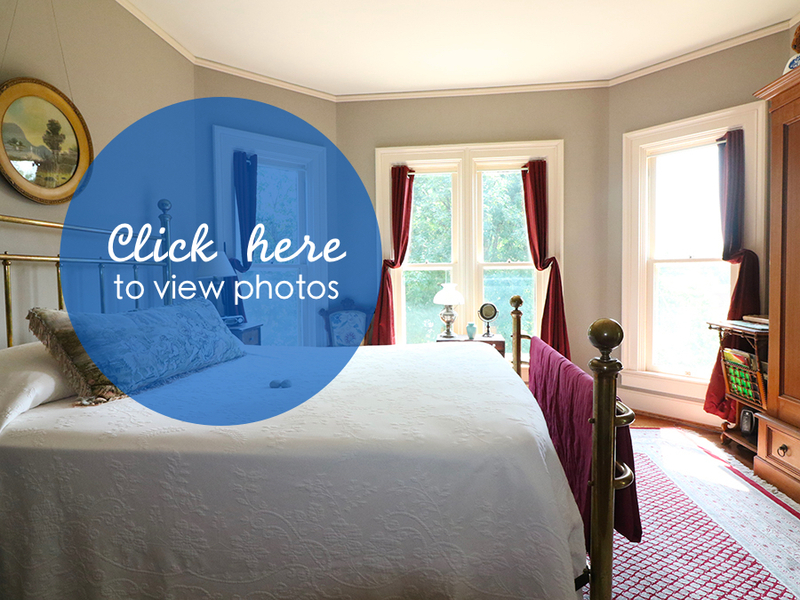 Among the home's original features are windows, hardware, molding and doors. And it still has a summer kitchen and an ice house, nods to the long-gone lifestyle of its original inhabitants. Waeber and his late wife, Jill, bought the home in 2007. They soon learned there was a lot of (expensive) work to do -- like fixing the roof, gutters, chimneys and porch foundation, and dealing with peeling lead paint on the home's siding. What's more, their previous home, a 1986 structure also in Milford but on the other side of I-275, had been full of "country antiques" that were too informal for the Victorian. "We brought them into this house, and they looked awful," Waeber said. Ever the entrepreneur, Jill decided to start an antique business, selling her finds from booth space at That Shop in Milford. "She was very good at picking out things people would want," Waeber said. She was also very good at picking out period pieces to fill their Victorian home, like the striking early 1900s Chinese wood wall hangings that were once part of a screen. In the process of fixing and furnishing their home, Waeber, a mechanical engineer who works part-time for an engineering consulting company, enjoyed learning more about the era in which the house was built. "The house is set up differently," he said. "It breathes the culture. It's not just about construction; it's about how people lived." For example, he points out that the kitchen, at the back of the house, was intended as a work room rather than a place for people to gather, as they might today. Because of that, it has less ornate molding than the other rooms on the first floor. Even its door is more decorative on the side that faces into the dining room than the side that faces into the kitchen. Similarly, upstairs, the molding in the master bedroom is more ornate than in the other bedrooms, which would have been used by the children. Although the historic features remain, many changes aimed at making the home more livable had already been made by the time the Waebers, both natives of Wilmington, Delaware, bought it. Previous owners had converted the kitchen pantry into a bathroom and enclosed the side porch, creating a laundry room on the first floor and a bathroom on the second. The Waebers made more improvements, always with an eye toward preserving the history -- all the way down to buying reconditioned gas lights to replace non-period fixtures. They also fixed up the summer kitchen, set up as a separate building because cooking inside the house in the summer would have been very hot in the days before air conditioning. "We never used it because we had to go outside," said Waeber, who shares the home with Rocky, an Australian and German shepherd mix. The solution was to connect that room to the rest of the house house via a small walkway, letting the summer kitchen that Waeber liked so much become part of the house rather than an outbuilding. Waeber also loves the results of finishing the attic. In one angular area, the exposed dark wood underside of the roof, nails and all, paired with the ladder-type stairs leading up to the roof feels a bit like being inside a lighthouse or telescope. "It's like a little hideaway," he said. With all the changes, Waeber said, he uses every part of the house -- about 2,500 square feet, or something like 3,000 if you count the newly finished attic. Outside, the front porch is a favorite feature. In choosing the home's colors, Waeber did his homework as usual. When he bought the home, it was gray and blue. "They weren't good Victorian colors," he said. "Victorians were very much about trying to make the colors fit the landscape." That's why his home is now decked out in earthy green, golds and white, with red and peach as highlight colors. Those complement the multiple textures -- vertical and horizontal siding, plus fish-scale shingles. "It makes it really alive, all the colors and shapes," he said. "That was very much the Queen Anne style." On top of everything he loves about the home itself, Waeber also loves its location near downtown Milford. "I never came down here at all before I moved," he said. "I absolutely fell in love with the area. The people are great."